David Elijah Impey, Jr. was born June 16, 1925 to Judge David E. Impey, Sr. and Mamie Louise (Larson) Impey in Houston, Missouri. He passed away on March 22, 2019 in Columbia, at age 93. David was preceded in death by his parents; his brother, William F. Impey; his sisters, Helen Virginia Beale and Mary Louise Brown; and his children, William David Impey, David Michael Impey, and Rita Louise Impey-Imes. He is survived by his wife, Rose; his children, John Thomas Impey of Houston, Julia Ann (Impey) Aubrey and her husband, Robert, of Oxford, Miss., James Edward Impey and Robert Lee Impey of Columbia, and Joseph Elijah Impey of Houston; his grandchildren, Emily Ann Ramnarine, Elizabeth Ann Churchwell, Michael Impey Aubrey, Robert William Impey, and Alexander Nicholas Impey-Imes; great-grandchildren Ariana, Jack, Henry, and Evelyn. David attended Houston schools until graduation with the Class of 1944. He held the rank of Eagle Scout and served as Scoutmaster of Troop 62 in Houston. 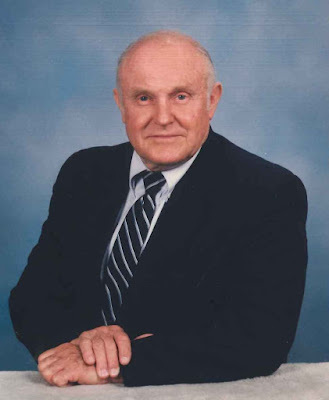 David served in the United States Army Air Corps during World War II, and in the Naval Air Reserve after WWII. He received honorable discharge from both branches of service and went on to earn a Bachelor of Science in Agriculture and a Masters of Education and Agronomy from the University of Missouri-Columbia. David and Rose Eleanor McNamee were married on January 1, 1948, having been married 71 years. David and Rose were named Citizens of the Year in 2006. Mr. Impey’s professional career was varied and diverse. He taught science, biology, and chemistry at Houston High School and taught agriculture to veterans under the G.I. Bill for a period of twenty years. He then entered the insurance field achieving extensive management and sales, including tenure as vice-president of the Midwest Insurance Company in St. Louis. He and his wife, Rose, and their family moved back to Houston and owned and operated Houston Insurance Agency from 1966-1991. Dave’s civic activities included numerous leadership positions in Houston: mayor, municipal county police judge, Texas County commissioner, City Councilman of Ward III, president of the Houston Chamber of Commerce, president of the Texas County Library Board, and president of the Methodist Men’s Club. As a county commissioner, Mr. Impey was instrumental in two major projects during his tenure, the Veterans Memorial Building and the Boiling Springs Bridge. He was a member of the Board of Directors of the Bank of Houston and the Lion’s Club. Before his death, Mr. Impey held the honor of being the oldest lifetime member of the Houston Methodist Church. Funeral Services were held Wednesday March 27, 2019 at 2 p.m. at Evans Funeral Home. Cremation followed under the direction of Evans Funeral Home.